Strong new biochemical evidence exists showing that the cereal grain sorghum is a safe food for people with celiac disease, who must avoid wheat and certain other grains, scientists are reporting. Their study, which includes molecular evidence that sorghum lacks the proteins toxic to people with celiac disease, appears in ACS’ Journal of Agricultural and Food Chemistry. Paola Pontieri and colleagues explain that those gluten proteins, present in wheat and barley, trigger an immune reaction in people with celiac disease that can cause abdominal pain and discomfort, constipation, diarrhea and other symptoms. The only treatment is lifelong avoidance of gluten. Sorghum, they note, has emerged as an alternative grain for people with celiac disease. In Western countries, sorghum traditionally has been an animal feed. But in Africa and India, it long has been a food for people. Recently, U.S. farmers have begun producing sorghum hybrids that are a white grain, known as “food-grade” sorghum. 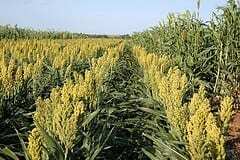 The researchers set out to make a detailed molecular determination of whether sorghum contains those toxic gluten proteins. They describe evidence from an analysis of the recently published sorghum genome, the complete set of genes in the plant, and other sources, that verify the absence of gluten proteins. The authors also report that sorghum has high nutritional value. “Food-grade sorghums should be considered as an important option for all people, especially celiac patients,” the report concluded. The authors acknowledge funding from the Regione Campania, the Istituto Banco di Napoli – Fondazione and the Compagnia di San Paolo.